This Shaker desk made of solid heavily figured curly maple features nine dovetail drawers, both pods are equipped with German gang locks, enabling the user to lock an entire pod of drawers with one turn of the key. The bottom drawer on both pods are legal size, and built to accommodate hanging file holders. Each pod has eight free floating panels, creating a piece that is striking from any view. This desk is available with traditional wooden drawer guides, or Knape & Vogt heavy duty drawer slides. Desk dimensions are 66" wide, 30 3/4" deep, and 30" high. 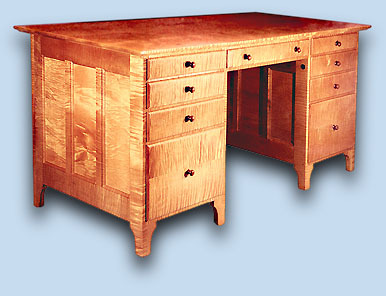 We build a wide variety of five foot executive desks in all hardwoods and pine.